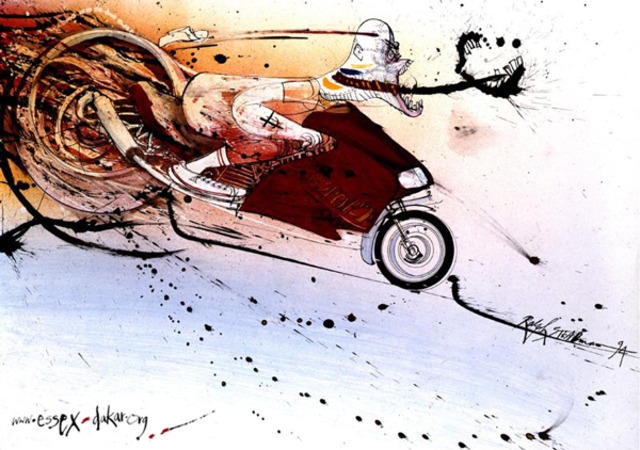 Essex-Dakar 'Hunter on Ducati' fundraising poster by Ralph Steadman. In 2005/06 Tim Fransen rode a motorcycle from Essex to The Gambia. This solo charity ride was called the Essex-Dakar an irreverent spoof of the much criticised Paris Dakar Rally. The project was successful raising £4,061 plus a Suzuki RV125 VanVan for SOS Children Villages and a further £1,023 for Riders for Health. Although riding solo, collaboration was key to this project's success, one leading participant was artist Ralph Steadman. Steadman kindly penned the Essex-Dakar logo and provided a license to print one thousand Hunter on Ducati fundraising posters. Hunter on Ducati was originally commissioned for Hunter S. Thompson’s legendary Ducati 900 Supersport road test Song of the Sausage Creature. (Thompson, H.S. (1995) Song of the Sausage Creature. Cycle World, March, pp.70-73). A2 lithographic print (produced at LCC).